For the purpose of carrying out customs operations with Clients' goods, our company is included in the Register of Customs Representatives - Certificate No. 0599/01 dated January 14, 2016. All goods (goods) transported across customs borders are subject to customs control by customs authorities and customs clearance. Customs clearance of goods transported across the customs border of the Customs Union is governed by the customs legislation of the Russian Federation and the Eurasian Economic Union (EAEU).Our company has been specializing in customs clearance and the delivery of goods of any type and volume for many years, and offers a full range of services in this industry to commercial and state enterprises engaged in foreign trade, as well as consultations in the field of customs legislation and foreign economic activity. We offer customs clearance services with local offices in Moscow and St. Petersburg, as well as ready to provide remote customs declaration throughout Russia because we have our representatives in all major cities of Russia. Verification of shipping documentation - invoices (invoices), packing lists, transport documents for compliance with the terms of the contract. Organization and provision of temporary storage of goods and vehicles in customs control zones (bonded warehouses, export warehouses and other NTA). The client, at a reasonable time prior to the delivery of goods, submits for verification a contract (contract) for the supply of goods, technical documentation for goods, financial documents for delivery in order to determine by our specialists the possible risks associated with prohibitions and restrictions when moving goods across the customs border, classifications goods for TN VED, determining the customs value and preliminary calculations necessary to make customs payments. When identifying prohibitions and / or restrictions on the import / export of goods, our specialists notify the Client about the need to obtain (provide) authorization documents (licenses, certificates, certificates, etc., etc.) and, if necessary, provide assistance services or independent obtaining the necessary documents. After checking and preparing a complete set of documents, documents are formalized in electronic form and a customs declaration for goods is formed. Next, expect the readiness of the goods for delivery. When importing into the customs territory - when the cargo is ready for delivery and / or shipment, we ask the supplier for copies of all shipping documents and perform additional checks of shipping documents for compliance with the terms of the contract. In cases of identifying critical inconsistencies (in quantity, cost, stock numbers (part number, weight)), we stop the delivery in a foreign country to our warehouses or partners' warehouses in order to bring the documents and / or goods in compliance with the terms of the contract. If the goods have entered the customs territory with the above inconsistencies, we are assisting the Client in resolving any issues with all the forces and capabilities. Our company provides, both separately and in a complex, the services of customs clearance and transportation of goods on favorable terms. Thanks to our great experience, our company will be able to do the work promptly and at affordable prices. When transporting goods abroad, we pay due attention to the accuracy and reliability of customs clearance. Customs legislation is currently undergoing a lot of changes, so only a professional who has extensive practical experience in this area can draw attention to all the details. Therefore, we do not recommend, without due experience, independently engage in customs clearance. Today, an increasing number of traders who value their time are turning to customs clearance services offered by leading companies in the relevant market segment. An important factor in choosing a partner in this matter is the quality and cost of customs clearance services. In order to understand how much the customs clearance costs in reality, you should consider what functions the contracting company assumes. We offer an affordable price level, excellent quality of services for the transportation of goods and customs clearance, as well as provide each of our clients with the necessary quality assurance. Turning to us, you can be sure that customs operations and transportation will be performed by us promptly, efficiently and at affordable prices. Regardless of the nature of the cargo and the characteristics of its transportation, we will be able to cope with such work, saving the Client from any difficulties with transportation and customs clearance.The customs clearance of goods is carried out by professional experts in the field of customs, having certificates and practical experience. It is knowledge of the legislation and experience that allows our specialists to correctly identify the features of each specific order. When performing international transport, it is invariably necessary to contact companies that offer customs clearance of goods. We will perform such work at a favorable price, guaranteeing the quality of the work carried out on customs clearance of goods, which will reduce the cost of each Client. We offer free consultations, so even before the direct conclusion of a contract with us, the Client will know exactly how long such work will require, and what is its value in our company. The cost of customs clearance services by our company is not too high, combined with the speed and quality of work performed. The cost of customs clearance services for each Client is calculated individually depending on the characteristics of the goods transported. 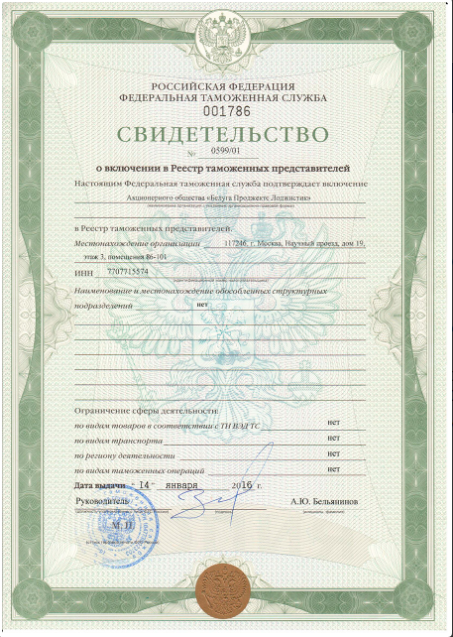 Our company is ready to provide services for obtaining permits, classification and other documentation necessary for the importation of goods into the customs territory of the EAEU or export from the customs territory of the EAEU both independently and jointly with the Client, depending on the situation and legal regulations. Such documentation is: licenses, certificates, opinions, certificates and other documents of state executive authorities or other institutions directly entitled to participate in government regulation of foreign economic activity. As well as documents issued by the customs authorities: preliminary classification decisions defining the HS code of the goods, permits of the customs authorities to import one product in separate batches for a long period of time, permits for processing to / outside the customs territory. Each Client (trader) must understand and know that the above documents cannot be received on behalf of our company, therefore we provide preparation of all necessary documentation, provide support at all stages of its receipt, or work by the Client’s power of attorney.